Click here to download the application form for the 2019 Kratz Summer Writing Fellowship (SWF) competition. Qualified sophomores, juniors, and seniors who have taken one 200 and one 300-level (or higher) workshop OR two 300-level (or higher) workshops at Goucher College by the time of receipt of the award are invited to apply. You may be concurrently enrolled in a qualifying workshop at the time of submission. Goucher Students from all majors/minors are eligible. Students do not have to be English majors with a concentration in writing in order to apply. Please submit application materials in the genre you intend for your completed project. Writing sample options: (a) submit up to eight poems; (b) up to 25 pages of short prose pieces (fiction or creative nonfiction); (c) a sample novel chapter (up to 25 pages) with a one-page plot synopsis; (d) one play; or (e) the logline/capsule of a screenplay along with a writing sample of its opening (up to 25 pages). Fiction writers, poets, creative nonfiction writers, playwrights, and screenwriters may apply. A student who has received a Kratz fellowship in the past can apply for a second fellowship ONLY IF they have turned in their final project for their first fellowship. If they did not submit their final project, they are ineligible to apply for a second fellowship. Fellowships may not be used to fund Intensive Courses Abroad (ICAs). Upon receipt of the award, no changes may be made in the category of the original proposal (for example, money awarded for an internship must be used for an internship). Projects funded must be completed in the summer—fellowships may not be used for a project scheduled to happen later. Fellowship awardees are required to submit a dossier of the writing produced during the fellowship to the Kratz Center in the fall semester following the summer fellowship period (click on the application for details). Applicants are urged to be specific and thorough in the articulation of their artistic agenda in the narrative and the budget. Avoid over-generalized statements; instead please carefully detail your artistic aims. For travel requests, rather than merely stating plans for a road trip, articulate how funds requested for travel reflect the applicant’s creative approach. Use scanners in the library (or elsewhere) to create scanned copies of the signed application form and waiver and merge all documents into one single PDF file which contains your complete dossier and email to kratz@goucher.edu. 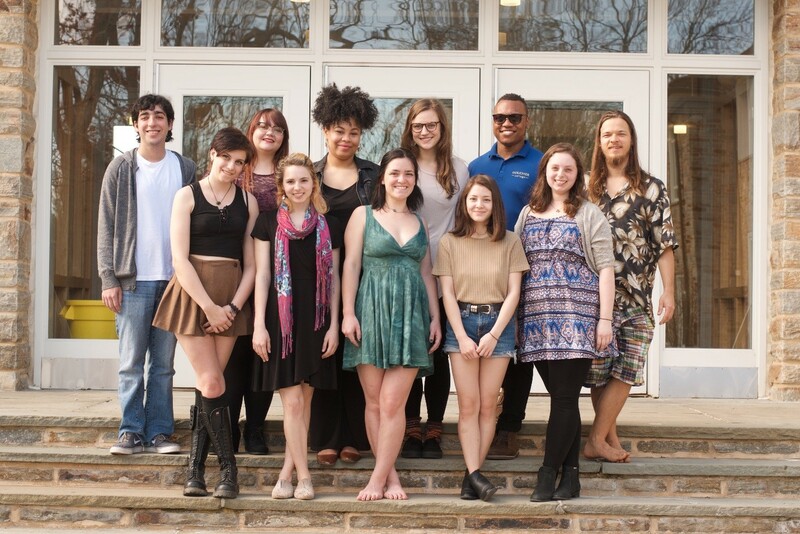 Front row (l-r): S. Surbhi, Taylor Mundis, Jocelin Ludolph, Madeline St. John; Back row (l-r): Elias Rosner, Olivia Habib, Anthony Young; Talia Military, Donche Golder. Winners studying abroad: Micaela Biegel, Shashaina Kanter-Molsky. 1) Micaela Beigel’s fellowship will facilitate travel to sites of Jewish history in Europe and Israel to write short fiction inspired by, and to further document the experience of, Jewish individuals and how they resisted oppression at the hands of the Nazis during the Second World War. 2) Adam Geller’s project will allow him to write about a journey with his Native American drum teacher in northwest New Mexico which will involve themes of culture and motherhood. 3) Donche Golder will write work involving an exploration into the lives and locale of the U.S. Virgin Islands in comparison to those of Curacao. 4) Kyle Graber will attend the Southampton Writer’s Conference, an intensive 12-day workshop. 5) Olivia Habib’s award will fund a summer internship at Bancroft Press, a local publishing house. 6) Shashaina Kanter-Molsky’s fellowship will facilitate travel to Madrid, Spain in order to study how the culture, vocabulary, and syntax of Spanish informs writing-based performance arts like theater. 7) Jocelin Ludolph will write a poetry portfolio informed by her summer internship experience at an animal farm sanctuary in the Catskill Mountains. 8) Talia Military’s fellowship will facilitate travel to access archives from local museums and libraries of selected small towns in California for research needed to complete a novel. 9) Taylor Mundis will travel to Florence, Italy to research and write about the locale and culture as part of an in-progress screenplay. 10) Elias Rosner’s fellowship will allow him to work with an artist in order to complete a single issue comic based on one of his short stories. 11) Madeline St. John will travel to England, France, and Hawaii in order to write an historical novel set in each locale during the late 1800s. 12) S. Surbhi’s fellowship will allow her to research and write a long-form literary journalism project documenting the rise of Indian millionaire prodigy Naved Khan. 13) Anna Young will pursue a non-fiction project resulting from her exploration of the dynamics of time valuation in the tourism environment of Door County, Wisconsin. 14) Anthony Young’s fellowship will facilitate collaboration with an artist to illustrate a single issue comic based on an in-progress screenplay and storyboard. Front row (l-r): Samantha Kelly, Cydney Cohn, Havah Berg, Donche Golder, Anna Baptiste, David Hills, Madison Krchnavy. Back row (l-r): Kayla Snyder, Maya Petkovic; Erika DiPasquale; Anna Young; Julia Gerhardt; Jamie Tull. 2) Erika DiPasquale’s fellowship will enable her to fulfill an internship at Pande Literary, a New York City literary agency. 3) Cydney Cohn’s project will involve travel to specific locations in Israel, including Jerusalem, to write poems about the culture, region and religion. 4) Donche Golder’s fellowship will enable him to travel across the U.S. by train and write poems that come out of the experience. 5) Kyle Graber’s project involves a 10-day self-designed poetry writing retreat with a Zen meditation component. 6) David Hills’s fellowship includes travel to and residence in New Orleans to write poems about the culture there (including, but not limited to, Voodoo). 7) Samantha Kelly’s project involves road travel in either the Philadelphia/Delaware area or the Boston area to produce a photo-poetry journal on the experience. 8) Kayla Snyder’s project features travel to Ireland to write poetry about the experience. 9) Anna Baptiste’s fellowship will enable her to travel to the Maxfuncon West Convention in Lake Arrowhead, CA to write a set of interconnected short stories. 10) Julia Gerhardt’s fellowship will allow her travel to work on a vineyard in Florence, Italy, and write fiction based on the experience. 11) Sophia Hancock’s fellowship will enable her to travel to Italy, Germany, France and Spain, to inspire short fiction from art and architecture. 12) Madison Krchnavy’s fellowship will involve travel to and residence in Canada with a group to write fiction on themes of friendship. 13) Maya Petkovic’s fellowship will enable her to attend the New York State Summer Writers’ Institute at Skidmore College. 14) William Stieglitz’s fellowship will allow him to attend the Stony Brook Southampton Writers’ Conference to complete his novel Boiling Point. 15) Jamie Tull’s fellowship will support research and writing about opiate addiction and treatment. 16) Anna Young’s fellowship will enable her to fulfill an internship at Bancroft Press in Baltimore. 1) Ashley Begley’s fellowship will allow her to explore the ways in which small-fiction fantasies can be utilized to question how the magic of childhood intersects with the colonial genocide enacted upon Native American communities. 2) Lucy Burchell’s project will involve work resulting from a journey to Cuba, where she will explore locales frequented by other American writers last century. 3) Isabel DaSilva’s fellowship will enable her to participate as a scholar at the Columbia University Summer Publishing program. 4) Adam Geller’s fellowship will enable him to perform traditional work on the Pow-Wow Circuit and write a Forty-niner and multiple non-fiction pieces about the life of contemporary Native Americans with particular emphasis on traveling performers and their relationship with food, music and history. 5) Rika Hoffman’s fellowship will support the creation of short stories inspired by revisiting her mother’s homeland of Japan and also by revisiting Taiwan, where she was a high school exchange student for one year. 6) Corey Isaacs’s fellowship will enable him to visit the Harry Ransom Center at the University of Texas at Austin to study the manuscripts of David Foster Wallace and to write fiction that is both informed and inspired by these documents. 7) Alice Johnston will generate a collection of poetry inspired by contrasts between expansive landscapes and enclosed rooms of lodging along the historic 192-mile coast-to-coast walk in Northern England. 8) Cynthia Koster will travel to New Orleans to research the justice system, tourism, and local culture as research for a mystery novel based in the city. 9) India Lamb’s project will involve the creation of a series of short stories in both fiction and non-fiction which involve the culture and true essence of Baltimore by showcasing its beauty as well as its hardships. 10) Anna Sandacz will process and reflect experiences in India through personal essay. 11) Jody Spence will visit various “melting pot” cities in the United States and then write a collection of poetry and a longer piece of creative nonfiction prose about being plus size in skinny America. 12) Rae Walker will write a series of poems related to migrating from the South to the North by traveling via railroad to undertake a poet’s version of Jacob Lawrence’s Migration Series. 13) Sabrina Silva will create a set of poems about her father by learning about his life in Portugal, visiting where he lived, worked, and studied, as well as the people closest to him. 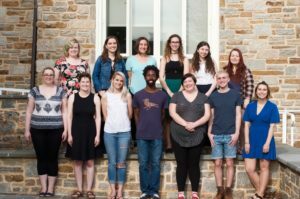 Pictured above: a few of this year’s new writing fellows after attending the First Friday Tea held by the English Department in the Soper Room of the Julia Rogers Building. Back row (l-r): Maring Eberlein, Marina Velázquez Suárez, Eliana Zimet, Gwendolyn Moiles, Allie Kessler, Dorie Chevlen. 1) Marie Claire Bryant will write memoir pieces and poems inspired by Dutch artwork during an extended stay in Amsterdam. 2) Dorie Chevlen will write fiction based on themes inspired by nature after traveling to Yosemite National Park. 3) Victoria Cooke will write the first 30 pages of a novel after traveling to the Harry Ransom Center at the University of Texas at Austin to examine their collection of J.D. Salinger’s unpublished manuscripts. 4) Isabel DaSilva will create a portfolio of poems centered on New York City while living there for the summer. 5) Emma Day will complete an internship as an editor at the Baltimore-based newspaper City Paper while writing stories that seek to explore Edgar Allen Poe’s classical horror tales and their legacy in a modern context. 6) Maring Eberlein will write a collection of short stories connected by the London Underground after staying in England for the summer. 7) Allie Kessler will live in New York and write a first draft of a novel featuring the theme of urban characters in rural settings and how their identities and relationships are informed by their struggle to find comfort and meaning in either place. 8) Sharon Landstrom will travel to Berlin to write a collection of poetry about a combination of the industrial landscape, art, and the history of memory in Berlin. 9) Madeleine Lasser will learn about poetry non-profit organizations’ influence on the representation of poetry in modern day society as she interns with either the Poetry Society of New York or The Academy of American Poets. 10) Caroline Less will explore how place inspires writing as she travels in Massachusetts and retraces the footsteps of Thoreau, Emerson, Eliot, Hawthorne, and Dickinson. 11) Tianna Mignogna will create a collection of poems, a memoir, and songs inspired by a music tour she will undertake with two fellow women musicians across eight different states. 12) Gwendolyn Moiles will write short stories and creative nonfiction to chronicle her summer spent revitalizing her family’s organic Maine blueberry farm. 14) Devorah Sperling-Billings will travel to Scotland to complete the final novel in a trilogy which she has been developing over the course of seven years. 15) William Stieglitz will travel to key eastern seaboard ports to research eighteenth century sea travel in order to prepare his upcoming historical novel Miracle. 17) Marina Velázquez Suárez will write short stories accompanied by illustrations while traveling in Italy. 18) Eliana Zimet will produce a mix of creative nonfiction and poetry after traveling to Berlin and Amsterdam to study the Holocaust and its impact on her family. 1) Marie Claire Bryant will write a collection of poems about Baltimore city. 2) Scott Carpenter will write poems based on travel to China. 3) Elizabeth Anne Causey will write fiction based on travel to Brazil. 4) Dara Crawley will write fiction based on the idea of the Southern African American Gothic. 5) Nola Dolan will write fiction based travel to Williamstown, Virginia. 6) Emily Hewlings will write poems inspired by study at the New York State Summer Writer’s Institute. 7) Noah Klein will write essays about your father while traveling to sites inspired by him. 8) Emilie Lewis will write a novel about horses while traveling in the Northern United States. 9) Lindsey Long will write a novella and play inspired by travel to Italy and the story of Galileo. 10) Samantha Richardson will write poems inspired by travel to Arles, France and the work of Van Gogh. 11) Craig Richie will write a play on the idea of friendship informed by cross-country research. 1) Corrine Bennett received funding to travel to Buenos Aires to produce fiction inspired by Borges and Cortazar. 2) Lisa Charron received funding to travel to Nepal and India to support the creation of contemplative poetry. 3) Hannah Fenster received funding to fund attendance a the Iowa Summer Workshops at the University of Iowa. 4) Alexandra Kessler received funding to travel and study among the fishermen and seafarers of Montauk, NY to support the creation of fiction. 5) Timothy Proser received funding to travel and research in Nashville and Pigeon Forge, Tennessee to support the creation of fiction about regional Southern male masculinity. 6) Raychel Rapazza received funding to support fiction about the past and present cultural history of New York City inspired by Dorothy Parker and Edith Wharton. 7) Anna Richardson received funding to travel and research at organic farms in California, Oregon, and Hawaii to support the creation of poetry. 8) Inga Schmidt received funding to travel to Valley Forge, Cuyahoga Valley, Badlands, Grand Teton, Zion, North Cascades, Theodore Roosevelt, And Glacier to create environmentally themed poetry. 9) Laura Tims received funding to attend the Stony Brook Southhampton Literature Conference. 1) Elise Burke, Class of 2012, received a fellowship to support the creation of a collection of historical short fiction informed by travel and study through Assateague and Chincoteague Islands in Maryland and Virginia. 2) Vincent Dajani, Class of 2013, received a fellowship to support the creation of a collection of magical realist fiction about psychic mediums informed by travel and study at Lily Dale, a psychic community in New York State. 3) Jacob Dilson, Class of 2013, received a fellowship to support the creation of a ten-poem portrait of a post-Katrina New Orleans based on fieldwork within the city. 4) Aaron Gilbert, Class of 2012, received a fellowship to support the creation of a collection of literary journalism about socioeconomically disadvantaged youth based on fieldwork in Portland, Oregon. 5) Omari Jeremiah, Class of 2012, received a fellowship to support the creation of literary journalism inspired by travel throughout Costa Rica. 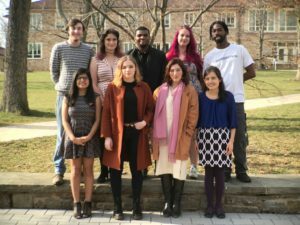 6) Camden Kimura, Class of 2012, received a fellowship to support study at Skidmore College’s New York Summer Writer’s Institute while writing a collection of poems. 7) Peter Krause, Class of 2012, received a fellowship to support the creation of a collection of poems based on his travels throughout several East Asian countries. 8) Lara “Bea” McQueen, Class of 2012, received a fellowship to support study at the Tin House’s Writer’s Workshop at Reed College in Portland, Oregon while writing a collection of fiction. 9) Raychel Rapazza, Class of 2012, received a fellowship to support internships and field studies at several literary agencies in the greater Boston and New Hampshire areas while writing a collection of fiction. 10) Laura Tims, Class of 2013, received a fellowship to support employment and field study at the Fine Print Literary Management Agency in New York City while writing a young adult novel. 11) Rebecca Titus, Class of 2013, received a fellowship to support fieldwork throughout the Southwestern United States while producing a collection of persona poems and original photographs. 12) Naomi Weekes, Class of 2013, received a fellowship to support fieldwork across the United States from East to West and back while writing poems about diverse American identities. 1) Luke Albao received funds to travel to Hawaii, the birthplace of his father for fiction. 2) Elise Burke received funds to spend two months visiting cities in West Virginia, Southern Virginia and North Carolina to get a stronger sense of the diverse faces of Appalachia, with the intent of using these local scenes, settings, and characters in her fiction. 3) Mieke deVrind received funds to support her research on an organic farm in Spain for a month to write a “Farmer’s Almanac” in poetry about the experience. 4) Kelly Anne Graves traveled to Kyoto, Japan for a month studying Japanese forms of poetry, including haiku, with the intent to compile a series of poems relating to the neuroscience and the mind. 5) Sam Legrys traveled to Ulaanbaatar, the capitol city of Mongolia, for a month (a country where he spent a semester last year and where he speaks the language) to support his new short stories. 7) Allyse Pollock traveled to Glasgow, the city of her oldest ancestors, to Clontibret, Ireland, the birthplace of her great-great-grandfather, and then to Dublin culminating in research, interviews and a fifty-page, one-act play using elements of documentary style drama. 9) Abigail Thomas, a self-confessed Francophile from a young age, traveled to Paris for two weeks to explore the topic through poems of how the revolutionary mindset came to the forefront in the 1968 French protests and how that influence has changed French culture and society over the intervening years. 10) Sierra Troy-Regier spent the month of July in Santa Fe, New Mexico writing fiction about Native American pueblos and reservations. 1) Holly Roland (for travel to Ecuador and the Galapagos Islands to write a series of poems and translate them into Spanish). 2) Rachel Stark (for an internship at Penguin Books in New York). 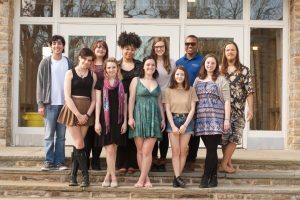 3) Chelsea Barolet (for an internship with “Poetry Out Loud,” a Maryland State Arts Council program). 4) Adam Marans (for a stay on the isle of Matinicus, Maine, to write a prose and poetry sequence). 5) Elli Westmoreland (for travel to Big Horn, Wyoming, for a photo-essay and writing projects related to the Big Horn Medicine Wheel). 6) Gregory Baer (for travel to Montreal for language immersion and to write fiction based on cross-lingual relationships). 7) Lindsay Stuart Hill (for a residency at Zen Mountain Monastery to develop a series of Zen-related poems). 9) Zach Martin (for travel to Lisbon for language immersion and a series of poems and translations from the Portuguese). 1) Elisabeth “Ella” Aroneau (to attend the Tin House Summer Writers Workshop). 2) Susan Dobinick (for an internship with Scholastic Books, a children’s book publisher). 3) Lindsay Stuart Hill (for travel to ruins and pilgrimage sites in Ireland to gather material for a series of poems). 4) Tim King (for travel to Spain to research a mixed genre-writing project about language and identity). 5) Geoffrey Leonard (for travel to Venezuela to research a novel in progress about land disputes and land rights in Latin America). 6) Zach Martin (for travel to Oregon and Washington State to gather material for poems in the style and spirit of Gary Snyder). 7) Meghan Meros (for travel along the Camino de Santiago, a pilgrimage trail, to gather material for a series of poems). 8) Kaitlyn Miller (for travel to Wales to gather material for a fantasy fiction project based on Welsh mythology). 9) Tim Quinlan (for travel along the Hudson River trail to gather material for his novel in progress). 10) Josh Sasson (for attendance at screenwriting workshops at the Maine Media Workshop in Rockporte, Maine). 11) Isaac Shapiro (for contribution to production expenses of “You Stole My Script,” a one-act play). 12) Julie Steinbacher (for travel to several mid-West/Western mountains to gather material for short stories). 1) Allison McCarthy: support for an unpaid summer internship at a literary magazine, The Baltimore Review. 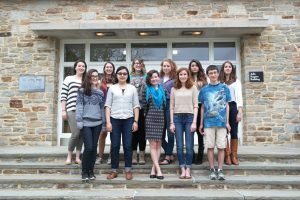 2) Phoebe Westwood: attendance at Skidmore Summer Writers’ Conference or Iowa Summer Writers’ Workshop. 3) Jillian Schweitzer: support for a three-week intensive course in Prague. 4) Jean Berger: support for travel in Israel to research a series of short stories about American Jews returning there. 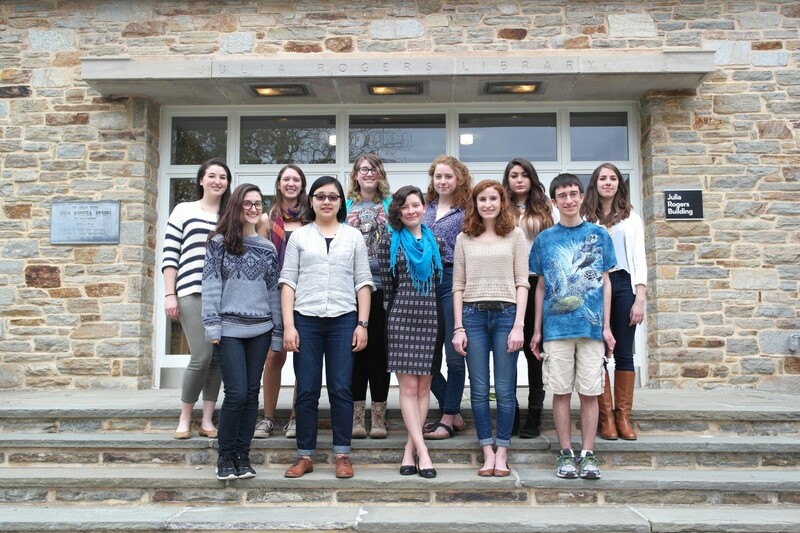 5) Rachel Bernstein: support to attend Skidmore Summer Writers’ Conference. 6) Ashley Farris: travel to literary sites in England to collect material for poems. 1) Mariah Healey: five weeks teaching photography to impoverished children in Guatemala and Honduras, to result in works of creative nonfiction. 2) Erik Oster: to attend the Paris American Academy during July, to result in short stories and essays. 3) Josh Sasson: to attend the Paris American Academy summer creative writing workshop. 4) Hanna Badalov: to support a trip to Barcelona, the capital city of Catalonia in Spain to write stories and poems influenced by Gaudi. 5) Michael Campochiaro: to support a road trip to the West to produce a group of stories most likely to be set in California or Arizona. 6) Jordana Frankel: to support the study of folkloric narratives and storytelling at the Festival on the Edge (England), the Yukon Festival (Canada) and the Timponagos Storytelling Festival (Canada) as background for an oral narrative/poem cycle. 7) Nathanael Wells Holbrook: to support travel to research stories and poems based on homes in Newport, the Hudson River Valley, and California (e.g. Hearst Castle and Winchester Mystery House. 8) Sarah Kendall: to support an internship at The Writers’ Center in Bethesda, Maryland. 1) Andrew Madison: to attend workshops in screenwriting, travel writing, and fiction at the Paris American Academy in France. 2) Allison McCarthy: to attend the Tinker Mountain Writers’ Workshop at Hollins University. 3) Anna Slesinski: to support a trip to Berlin to meet her German relatives and write a braided narrative about them. 4) Rebecca Rosenberg: to support a visit to Chicago for research for a novel about gay marriage set there. 5) Elizabeth Kaldor: to attend the Juniper Summer Writing Institute at the University of Massachusetts at Amherst, where she will study fiction writing with Grace Paley. 6) Scott Sell: for travel to the towns at which the writer Raymond Carver was born and raised (Clatskanie, Oregon, and Yakima, Washington). 7) Adrienne Casalena: to offset travel to Siena, Italy to take intensive language and literature courses at the Center for Study Abroad. 1) Naa-Norley Adom received a fellowship to complete an internship with “A Gathering of Tribes,” a New York City arts organization. 2) Adrienne Casalena received a fellowship to complete two-week course on Modern Irish Writers in Ireland. 3) Nairobi Collins received a fellowship to complete an internship at Lollipop Magazine in Baltimore and work on a sequence of autobiographical stories. 4) Caitlin Corrigan received a fellowship to conduct self-supervised work on a series of poems and essays on how community manifests itself in different places. 5) Jeffrey Dieter received a fellowship to conduct self-supervised work involving the writing of a series of poems exploring his family history. 6) Shoshana Flax received a fellowship to attend a Playwriting Workshop at the Allihies Language and Art Center in West Cork, Ireland. 7) Greg Wolff received a fellowship to support an extended visit to the Pennsylvania State University graduate program in philosophy to research a novel-in-progress about students in a similar program. 1) David Spencer: for research for a third novel set in Baltimore City and Harford County. 2) Kristen Jenkins: travel to Lithuania as background for a sonnet cycle. 3) Helen McLaughlin: attendance of the Iowa Summer Writing Festival. 4) Jared Fischer: travel to Grignon, France to support poems. 5) Jocelyn Heath: Internship at Baltimore Magazine. 6) Matthew Ashby: for a cross-country trip including stops in Wisconsin, Montana, Colorado, California, Louisiana, Texas and Tennessee, as background for a multi-media project in collaboration with Bryan Bieniek, a painter at the Maryland Institute College of Art. 7) Maryah Converse: a fiction writer with a special interest in science fiction and fantasy, for travel to Germany to translate a novel by the German fantasy Wolfgang Hohlbein. 8) Itta Englander: for trips to New York City and Washington DC, to research a collection of short stories about the experience of immigrant Jews. 1) Laura Bogart: attendance of the Honors Colloquium on Beauty, Harmony and Proportion in the art of ancient Greece. 2) Megan Skyler Breeden: summer internship at the Core Knowledge Foundation in Charlottesville, VA, founded by E.D. Hirsch in 1986. 3) Rachel Loeper: attendance of summer program at the Naropa Institute’s Jack Kerouac School of Disembodied Poetics. 4) Maria Folsom-Kovarik: summer internship at the non-profit organization VÍDES West USA to produce creative nonfiction. VÍDES is an international volunteer organization seeking to educate socially at risk youth, especially women. 5) Sarajane Snyder: attendance of the Sitka Symposium in Alaska, to produce fiction and creative nonfiction. 6) Jessica Bowers: to support a summer internship at Style Magazine in Baltimore and work on a novel-in-progress involving taxidermy and museum curating. 7) Jennifer Fortin: travel to New Brunswick, Canada, the geographic base for the Mi’kmaq tribe of the Cree Nation, from which she is descended. 8) Hannah Leatherbury: for travel to Quebec for foreign language immersion to support work on a novel featuring linguistic dislocations between several different languages, as experienced by a character operating outside the context of her native tongue. 1) Elizabeth Allee: travel across America from West Virginia through New England, South Dakota, Wyoming and Nevada, culminating in volunteer service in the editorial offices of the magazine of the Best Friends Animal Sanctuary in Kanab, Utah. 2) Sarah Raz: May-August internship with the newsletter “Help to Increase Peace,” supported by the American Friends Service Committee in Baltimore, Maryland. 3) Stacy Grimes: “Up Home,” multi-voice narrative based on oral history project about the Depression era in Rural Western Maryland. 4) Shauna Kelley: June-July internship with Whitston Publishing Company in Albany, New York. 5) Kristy Raffensberger: June-August attendance of six-week Columbia/Radcliffe Publishing Program. 6) Andrej Krasnansky: month long camping tour of Alaska, to result in a combination of fiction, poetry, photo-essay.